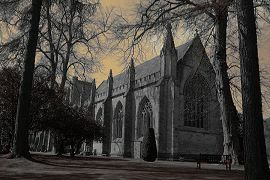 The melody for Highland Cathedral was originally written as a pipe-tune by two Germans, Michael Korb and Ulrich Roever. Moira Kerr has added her own words to this well-known tune. She has recorded it in her CD album Loch Lomond Hills. Scotland a nation, proud and free. Leading us onward to victory. Together we stand, with faith in our land. Scotland we will be there. By our forefathers in the past. In a Highland cathedral, where the pipers played. Words copyright © Moira Kerr.